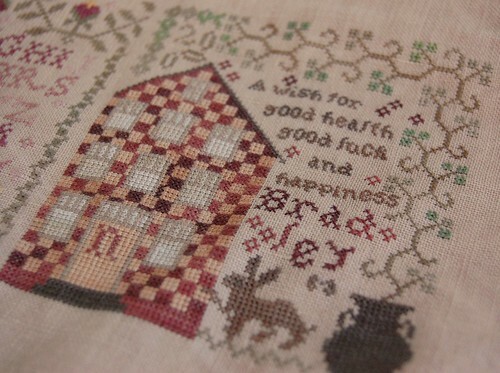 Nicole's Needlework: A Wish For You Finished! I finished the fourth block on Anniversaries of the Heart yesterday. I think it turned out pretty cute. I'm going to get started on block number five later. Here are the threads for it, I think they're so pretty! Well, hope you all have a great weekend! Write soon! It looks wonderful Nicole. You're making great progress on this piece. And I have to agree, those colors are wonderful for the next block. It looks fantastic - I so enjoy viewing your work - Always so beautiful !!!! Looks great. I've recently picked up Fairy Flora from Mirabilia. I need to get stitching, so I can start new designs. Looks great! 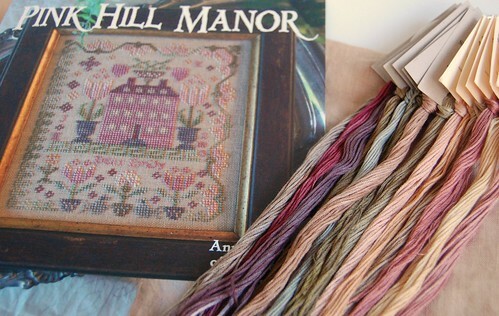 Pink Hill Manor and Farm House both have very yummy colors! Love the way the whole thing looks! Your little houses are beautiful, Nicole. Woohoo!! It looks great, Nicole! Nice personalization. Nicole, your stitching is always SO inspiring.. I just love it! Beautiful work, as always! Wonderful finish. I have thought of doing this but the size keeps me guessing whether I should or not. Beautiful! You are making great progress Nicole! It's looking lovely Nicole, great progress! Wow! What gorgeous colors for this one. I see you stitch on 40 count a lot. Did it take getting used to when you first started? I ordered a few pieces of 40 count to try, as I want to stitch some bigger pieces, but have them finished off as a smaller size. Any tips, suggestions? Thanks.